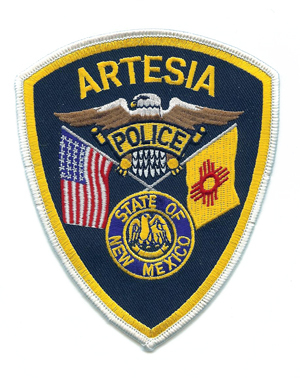 An Artesia man was arrested Tuesday after attempting to flee from an Artesia Police Department officer due to an outstanding warrant on multiple charges. Daniel J. McDonald, 31, of Artesia, was travelling south on First Street just after 5 p.m. Tuesday when an officer attempted to initiate a traffic stop due to the vehicle’s illegally tinted windows. McDonald turned right onto Logan Avenue, then left onto Seventh Street, where he began to accelerate in an attempt to elude the officer. APD continued to follow well behind McDonald, who eventually attempted to turn left off of Champ Clark Avenue onto Roselawn Avenue but struck a curb while rounding the corner and came to a stop. According to the report, McDonald then exited the vehicle and attempted to run west, but as the officer pulled up, he stopped running and put his hands in the air. McDonald was subsequently arrested on charges of unlawful use of a suspended or revoked license and fleeing or attempting to elude an officer. An outstanding warrant was then discovered. The warrant stemmed from a May 17 incident involving children, one of whom had arrived at school that day with a black eye. According to the police report, the school counselor spoke with the student’s younger brother, who told her the girl had been punched by their mother’s boyfriend. When asked by the counselor if that was what had happened, the girl affirmed. The children were signed over into the temporary custody of the Children, Youth and Families Department, during which time interviews were conducted. One of the children told investigators his mother and her boyfriend, identified as McDonald, had gotten into a fight while driving. He and his older sister were in the car, and the child told police McDonald had grabbed his mother’s hair and hit her as she tried to protect his sister. The boy said McDonald had struck his sister in the eye. The report states the girl then confirmed to investigators that McDonald had struck her with a closed fist in the eye. The girl also told police McDonald had “told everyone not to call the police” and punched and pulled her mother’s hair when she told him not to do that. A warrant was subsequently issued for McDonald on charges of false imprisonment, battery against a household member, battery, and interference with communications. He was also arrested on those charges Tuesday.